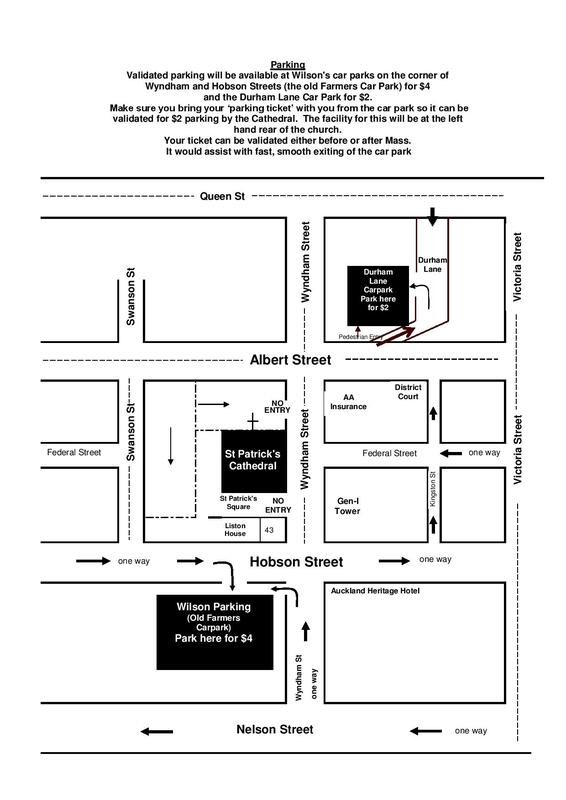 After 2 years of providing the parishioners of St Patricks Cathedral with $2 Sunday Mass parking, Wilson’s have increased the validated Sunday parking at Wilson’s Hobson St Car Park (old Farmers) to $4 for 3 hours. Wilson’s continue to offer St Patrick’s Cathedral $2 Sunday Mass parking at the Wilson’s Durham Lane car park. This car park also offers 3 hours of validated parking on a Sunday. Please Note this increase applies from 1 APRIL 2016. Mobility Cards: A few spaces are available on either side of the Cathedral doors for people with disabilities. These spaces must be kept free for people who really need them . Please be considerate. Walk: The Cathedral is a short walk from Auckland’s major downtown hotels and local apartments. Cycle: Bicycles can be secured against the stone walls on either side of the main doors of the church. Taxi: Taxis are not inexpensive but they do save the hassle of trying to find a car park for a private vehicle. Bus: The Auckland central business district is well served by bus transport from all outlying Auckland suburbs. Train: The Britomart Train Station is located downtown and is within a 10 minute walk of the Cathedral. Ferry: Ferry transport is available from the North Shore (Devonport and Northcote), the eastern suburbs (Half Moon Bay) and Waiheke Island. Ferries arrive at the downtown ferry terminal, a ten-minute walk to the Cathedral. Street Parking: Some metered street parking is available on Swanson Street, Federal Street and other surrounding streets. Parking Garages: There are two parking garages, with a total capacity of over 1000 vehicles, located within 100m of the Cathedral. Parking for Weddings, Baptisms, Funerals: You are able to avail yourself of theparking at Wilson Park for weddings, baptisms and funerals held on SATURDAY. Special Events: For special events IN THE EVENING AFTER 6:30PM during the week, e.g. Rite II Reconciliation, Chrism Mass, special Diocesan Masses, validated parking is also available. We are very grateful to Wilson Parking for their assistance with parking nearby the Cathedral.